Avengers: Infinity War is a staggering accomplishment, from a purely logistical standpoint. The film features approximately fifty major characters drawn from ten years of cinematic storytelling, all drawn together to face a major existential threat in a story that spans from a fictional African kingdom to the depths of outer space, all told within two-and-a-half hours, and all packaged in a neat and easy-to-follow delivery mechanism. Marvel Studios and the Russo brothers might make it look easy, but there’s no denying the level of skill and technique involved in shepherding a story like this to the big screen and making it work in a fundamental “this is entertaining” kind of way. It’s important not to undersell this, not to dismiss the level of craft involved in stitching together a coherent narrative from the differing lengths of cloth. There is pleasure to be had in watching the various characters come together; in watching Peter Quill get insecure around Thor, in listening to Rocket joke about stealing the Winter Soldier’s arm, in the fact that Tony Stark and Stephen Strange spend the bulk of the movie attempting to out-Sherlock one another. Infinity War succeeds on these terms. It’s easy to be dismissive of this cinematic experiment, given how easy it looks, but that does not diminish the accomplishment. However, there’s also something gnawing away in the background of Infinity War, an awkward question that the film never actually answers. “What is this actually about?” somebody might legitimately ask, and there are any number of possible answers. Infinity War is a film about a big purple dude with a magic glove. Infinity War is about paying off ten years of continuity. Infinity War is about proving that it is possible to make a movie like Infinity War. Infinity War is about ensuring that the next Disney shareholders’ meeting is a blowout party. All of these are legitimate answers, but they dance around the truth. On its own terms, taken as a piece of popular culture projected on to a screen for two-and-a-half hours, Infinity War isn’t actually about anything. When people sit down to look at Infinity War in the years and decades ahead, to dissect and examine it, what will they come back with? What is it actually saying? What is it actually talking about? Not even in some grand “thesis statement about the universe” way, but in a more basic “this is the thematic arc of the film” manner? Watching Infinity War, there is a deeply uncomfortable sense that Infinity War is about nothing beyond itself. Watch! Avengers: Age of Ultron Trailer! The trailer for Joss Whedon’s Avengers: Age of Ultron has arrived. Check it out below! This March, to celebrate the release of Captain America: The Winter Soldier, we’ll be taking a look at some classic and not-so-classic Avengers comic books. Check back daily for the latest updates! One of the more endearing aspects of comic book publishing is the way that the “little guys” occasionally get a shot. There are mountains of titles published each month featuring iconic characters like Batman or Wolverine, but the major companies are occasionally willing to check chances on more quirky and unknown characters using top-tier talent. One of the big surprises of DC’s “new 52” relaunch was the decision to put superstar writer Geoff Johns on pop culture joke Aquaman. Despite the fact that he has never quite set the world on fire, Marvel seems willing to invest in repeated attempts to launch the character of Moon Knight. Most recently, writer Warren Ellis has launched a new volume of the comic with artist Declan Shalvey. However, before the latest relaunch, Marvel tried another high-profile take on Moon Knight written by Brian Michael Bendis and illustrated by Alex Maleev, the duo responsible for one of the best-loved runs ever published on Daredevil. 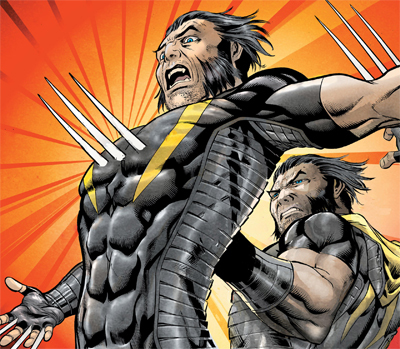 The series made it to twelve issues, before Marvel cancelled it due to disappointing sales. Bendis has insisted that it was always the plan to end the series after twelve issues, but it seems strange that the series was not announced as a miniseries. 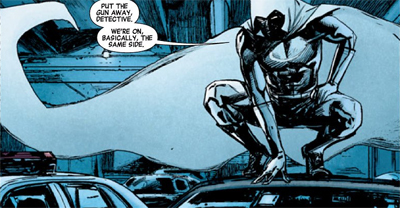 Still, it’s easy to understand why Moon Knight struggled to find an audience. It’s great to have Bendis and Maleev crafting an on-going street-level comic book, but the series seems almost at war with itself, struggling with the difficulties of fitting this character in this particular role. Age of Ultron is Brian Michael Bendis’ last hurrah on Marvel’s massive Avengers franchise. Bendis began writing Avengers when it was a third-tier comic book property, and he was – in a large part – responsible for turning the comic franchise into a sales juggernaut. The fact that Marvel was simultaneously working on a massive cinematic universe built around these characters – if only because they’d sold off most of the other ones – probably didn’t hurt. So, with Bendis moving off the Avengers franchise, ceding the crown of lead Avengers writer to up-and-comer Jonathan Hickman, he wrote Age of Ultron. It was a story the author had been hinting at for quite some time, from the first arc of his relaunched adjectiveless Avengers title through to his short run on Moon Knight. Having completed a grand sweeping story arc running from Avengers Disassembled through to Siege, Age of Ultron feels like an epilogue to Bendis’ run – a post-script to the tenure of the man who changed the franchise. It also feels, rather awkwardly, like the most self-consciously Avengers-y Avengers story ever aveng(er)ed.